Layers of lasagna noodles, fresh spinach, mozzarella and ricotta cheeses, and a trio of ground beef, hot sausage and veal make up this delicious casserole which is topped with homemade tomato sauce. 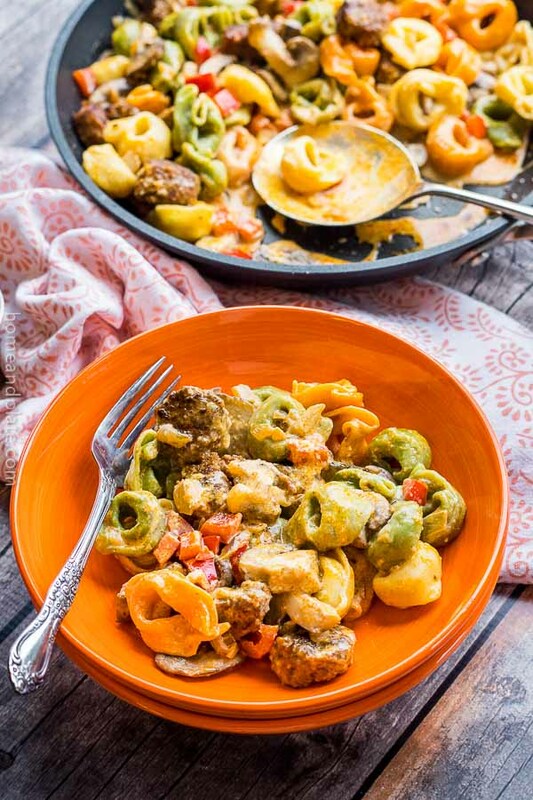 Earthy mushrooms, sweet red peppers, spicy sausage and cheesy tortellini is smothered in a creamy Alfredo sauce and is served in under 30 minutes. This easy baked skillet pasta recipe features the flavors of pork sausage and fennel in a red wine ragu. It’s cheesy, meaty and delicious and can be on your table in under an hour. A classic summer pasta salad featuring juicy red ripe tomatoes, fresh mozzarella cheese, homegrown basil and cheesy tortellini. Need a quick dinner? Make a big bowl of pasta filled with fresh vegetables, flavored with basil pesto and sautéed shrimp. Hot sausage and succulent shrimp marry well smothered in a spicy Parmesan cream sauce atop of bed of rigatoni. Cold snowy nights in Ohio call for great tasting homemade soup. This one-pot vegetable tortellini soup is loaded with fresh vegetables and fresh cheese tortellini. Creamy pillows of pasta that hint of mashed potatoes, earthy mushrooms and salty pancetta, swirled in a light and creamy sauce. Doesn’t that sound delicious? Want the recipe? If you have 30 minutes, you can whip up a restaurant-worthy dinner of creamy fettuccine alfredo with hearty mushrooms and juicy chicken. And everything is better with bacon. Keep it cool this summer with this Greek avocado pasta salad featuring summer’s best vegetables. Enjoy a rainbow of vegetables in this easy-to-make summer pasta salad. Delicious chilled sesame noodles with a sweet and spicy peanut sauce comes together easily for a weeknight dinner with plenty for leftovers.